Call us at 630-216-4440 for a free over-the-phone pest control consultation. Have ants or other pests invaded your home? Our professional ant removal exterminators have answers for you. With your limited experience treating ant infestation, we’re your best solution. Our certified pest control experts are extremely proficient. We’re capable of exterminating any pests, including cockroaches, rodents, bugs, ants, bugs, flying insects and other invading parasites. Our company offers reliable, affordable residential and commercial pest control services to the Naperville and Aurora, Il areas. Call at 630-216-4440 to speak with a Naperville pest control consultant. We care for your home or business just as much as you would. All work is guaranteed to last (call for specific details). Work with a safe, experienced pest control company by choosing us. We get tired of talking about ourselves, though. Look at our reputation online to really get an idea of how good of a job we do. You can sleep well knowing that your pest problem is in the hands of a professional. Depending on your specific situation, we will give you an accurate estimate and proposal to complete the job. Let us take control of your pest situation to eradicate a current problem and prevent future problems. Residential and commercial pest control services are offered in the Naperville and Aurora area. Call us at 630-216-4440 to speak with a representative of our company and schedule someone to come out. Your home is an investment. It is your responsibility as a homeowner to make sure that it stays clean and appealing as time goes on. Protecting your homes resale value is one of your main missions after purchasing a home. Ensuring that there are no ongoing pest issues is important. To shield your home from deterioration and loss of value, it is imperative that you focus on pest control inside and out. Professional pest control is the smartest way for you to take care of any pest issues that you see. There are many do it yourself methods for pest control, but professionals can take care of specific problems without having to troubleshoot and waste time. Practicality should be high on your priority list when maintaining your home. Guessing and troubleshooting are two words that should not be used when dealing with pests. Hire a professional pest control company to take care of your home and rest easy. Equipment and chemicals used to prevent pests and deter pests are not to be handled by inexperienced people. There is great potential for injuring oneself or others when dealing with dangerous chemicals that are made for pest and rodent control. In order to maintain the integrity of your household, hire the proper pest control professional to maintain your home and protect its resale value. Mice control service in Naperville, IL. Having a problem with mice? Call now. Despite living in a home and having your eyes and ears open at all times, you are NOT completely protected from pests/rodents. Dark, humid corners, attics, areas behind the wall, under the couch, in the bed, etc. are all areas where pests can form breeding ground. I don’t mean to give you the heeby-jeebies but it is reality. The need for pest control is real. Before investing your hard earned money into a professional pest control service, familiarize yourself with the five most common types of pest control methods. The BEST method to control pests is to take action before a situation occurs. Obviously pest control isn’t at the top of our to-do lists considering our to-do list usually has 20 other things on it. Try and take the time to seal potential entry points, eliminate potential food sources, and lock down all breeding grounds that may attract unwanted pests in your home. A preventative consultation with a pest control expert typically isn’t expensive because they aren’t actually doing any elimination work. With this method the exterminator will use bait to bring pests to a central location where they will be trapped. The bait is almost always poisonous to ensure that the pests cannot get away once they get there. The bait typically is spread throughout the colony to hopefully destroy the entire system. Some pests are attracted to other types of insects or rodents. Some pest control situations will require the exterminator to use the food chain to eliminate the issue. This is the most common method of pest control for the do-it-yourselfer. Home Depot, Menards, and other hardware stores offer a number of chemicals to help you control your pest situation. DIY work is not recommended if you are having a serious pest infestation. Pest infestations can RAPIDLY multiply and the longer you wait, the more expensive it will be and the more difficult/time consuming it will be in the long run. Rats, Mice, and other rodents will have to be trapped. Specific traps are made for different types of animals and they have a great success rate. Professional pest control services take care of uninvited guests like ants, bed bugs, bees, flies, termites, cockroaches, and rodents like rats, mice or moles. These infestations can happen in businesses or residential homes. When pests are causing you trouble, your best move is to hire a professional who can assess and take care of the specific issue. Avoid calling the wrong company by following these five tips to hire a pest control company. Professional pest control companies should have proper business insurance to protect YOU as well as themselves. If something happens to your home and the person running the business doesn’t have proper insurance or the money to cover the issue, then you are both out of luck. You will be waiting around forever to be reimbursed for the damages caused by the illegitimate business. Professional exterminating and pest control should be left to the PROFESSIONALS… not the rookies/do it yourselfers. Make sure you are hiring a company that has some experience under their belt. Take a look at how long they’ve been in business, online reviews, social media activity, and more. Proper due diligence can save you a large headache down the road. The right company will have the proper equipment and chemicals as well as the knowledge to assess unique infestations. From there they will be able to use their experience to decide what the best way to deal with the issue is. Good exterminators think about the safety of their surrounding environment before proceeding with a pest control job. Many pesticides contain chemicals that are harmful to the environment. As a matter of fact, most jobs can be done WITHOUT the use of harmful chemicals. Make sure you inquire about this if it is a concern. 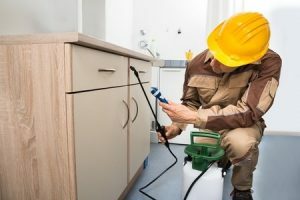 This is a serious topic because if an amateur exterminator uses the wrong chemicals in your home, it can cause serious health problems to inhabitants of the home. This topic deserves its own section. Online reviews can be found on Google, Yelp, Facebook, and other sites. Make sure you do proper online due diligence before hiring a pest control company. A company that does a lot of business should have a decent amount of reviews online. It should tell you something if a company only has one or two reviews because that means that they aren’t doing a lot of business. Reputation carries companies further than any form of advertising available. A company can spend a million dollars on advertising but if they have a tarnished reputation or no reputation then they may never have a chance to be hired. On the other hand if a company spends zero dollars on advertising but everyone and their brother are referring them to their friends, it could be the most popular company in the area. Check social media to see what people are saying about the company you are thinking about hiring before making a decision.